You must be logged in and have a Barcode # linked to purchase this product. Please use the Login button below to login or create an account. 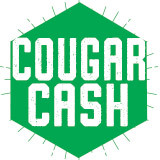 Cougar Cash can be used at any of our locations, 7 days a week, 24 hours a day. Make sure you have what you need to buy what you want.